The classic lounge suit is your wardrobe staple. Add a waistcoat to make it more formal. 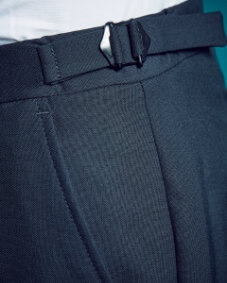 For business we recommend navy and charcoal in a variety of plain and semi plain fabrics. For parties or weddings, the world is your oyster. 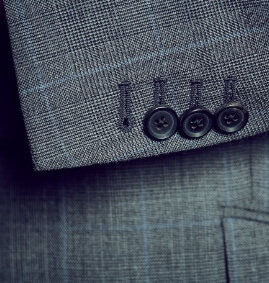 One button fastening is often the most flattering but two front buttons remain most popular. Double breasted jackets are rare but still available in a variety of button formations. Tailoring need not be formal. And causal does not mean scruffy. An unstructured two-piece suit or soft shouldered jacket with a slim leg trouser can be cool and relaxed but still refined. 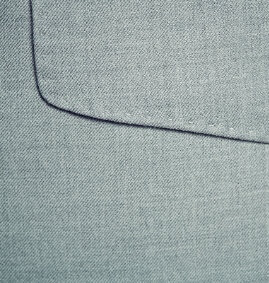 Our latest relaxed block and collection of fabrics with natural stretch make for the ultimate in soft bespoke tailoring. Whether you opt for a lounge suit, tux or morning wear, the fit is critical. Start the process 10-12 weeks before the big day to allow our tailors plenty of time for all the details and any extra fittings. Select a lining to complement the wedding theme, embroider a message on your undercollar, let us make coordinating ties or cravats… the list is endless. Not all dinner suits are created equal. 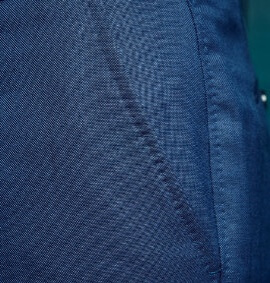 A beautifully tailored tuxedo in midnight blue complete with satin lapel will steal the show every time. If you can’t abide etiquette, consider velvet or even a coloured tux with black satin trim. 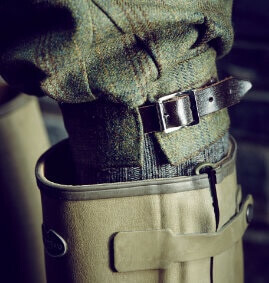 We offer hundreds of tweeds, thorn-proof worsteds and wax fabrics for gilets, field coats, action back jackets, breeks and caps. And everyone needs a tweed jacket in the wardrobe, even if they never leave the city. There is discount available for multiple orders in the same tweed. We can also design and weave your own bespoke tweed fabric.